These Lebanese Stuffed Grape Leaves (Warak Arish) are made with a spiced ground beef and rice mixture - a delicious Mediterranean dish commonly served as an appetizer! This is my all-time favorite Lebanese dish that I grew up eating and actually grew up helping my mom make! 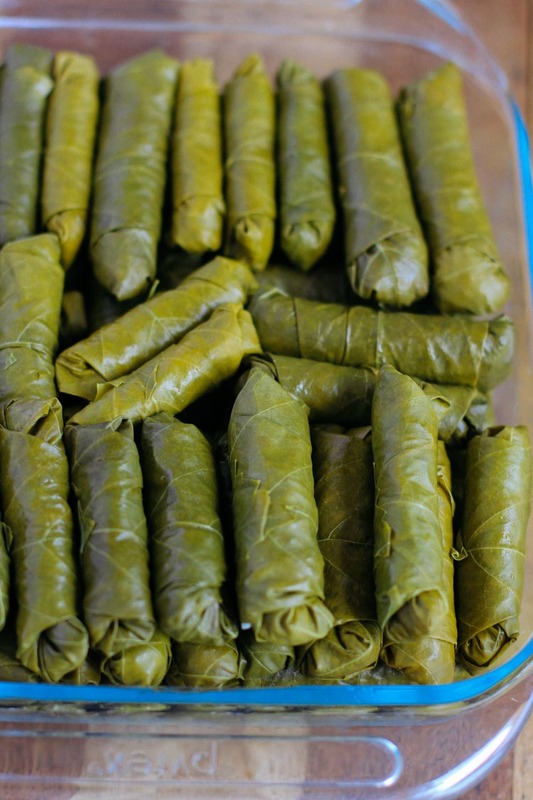 I speak arabic and we call it “warak enab.” I may not have learned to cook until after I was married, but I learned to roll Stuffed Grape Leaves when I was probably only 12 years old! And can I say, I think I’m pretty good at rolling! Rolling the grape leaves can be very tedious, which is why I usually only make this dish a few times a year. And if I ever ask my mom or mother-in-law to make it for me, I always offer to help with the rolling…it kinda becomes a “Warak-And-Roll” party…haha! The first part is the hashweh. Hashweh is an arabic word for stuffing. There are many variations of the hashweh, but the two popular ones are these meat and rice with spices and the the vegetarian version with no meat. This recipe is made with grape vines leaves (warak arish/anab), rice, ground beef, 7 spice seasoning and lemon juice. To make the meat stuffed grape leaves, I use a non-stick skillet to brown some ground beef. Then I add the seasoning and uncooked rice. That basically makes up the hashweh [the rice will cook while the grape leaves cook]. And then the rolling starts. The best way to do it is to lay a grape leaf flat on a cutting board, place a tablespoon of the stuffing in middle of the leaf, and carefully fold in the sides and roll it like you would when making a wrap. Pretty soon you’ll end up with the rolls looking like this, and the tedious part is over! Next I use a deep pot for cooking the warak enab. 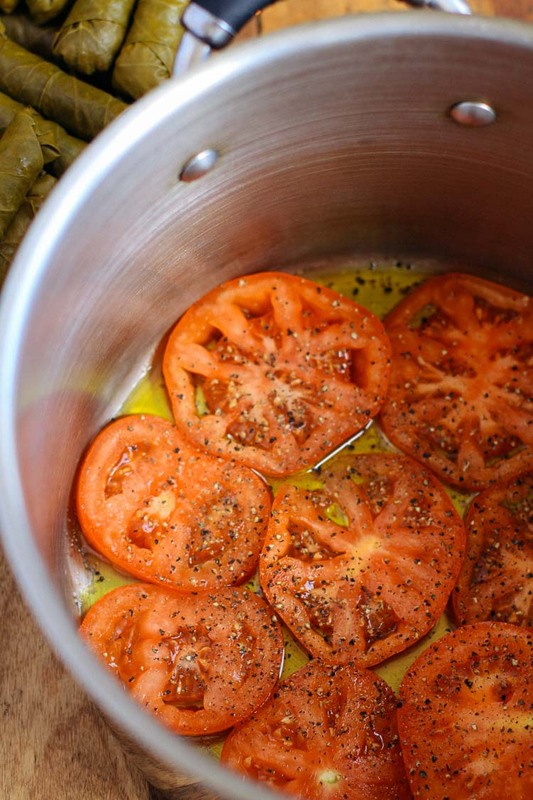 I start by layering the pot with olive oil, sliced tomatoes and/or potatoes. Then I add the stuffed and rolled grape leaves over them and repeat the delicious layers. Adding the tomatoes is a great tip to ensure that the warak enab don’t touch the bottom of the pot, which can result is charred grape leaves. It’s also very popular to place a lamb rack on the bottom of the pot. Here is the pot of the warak enab all rolled up and ready to be cooked! Then it’s cooking time until the stuffed grape leaves are tender, juicy and utterly tantalizing! Trust me, you will be eating them straight from the pot while they’re still piping hot! 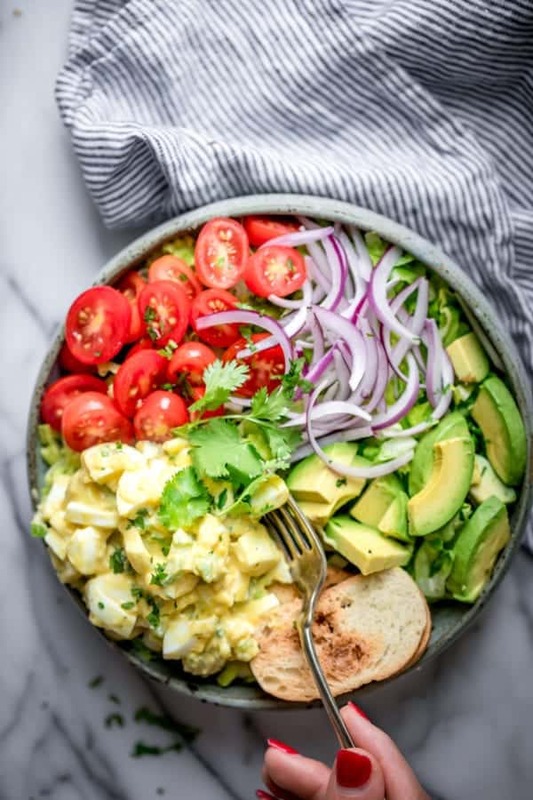 This dish is very popular in several Mediterranean countries and in the Middle East. 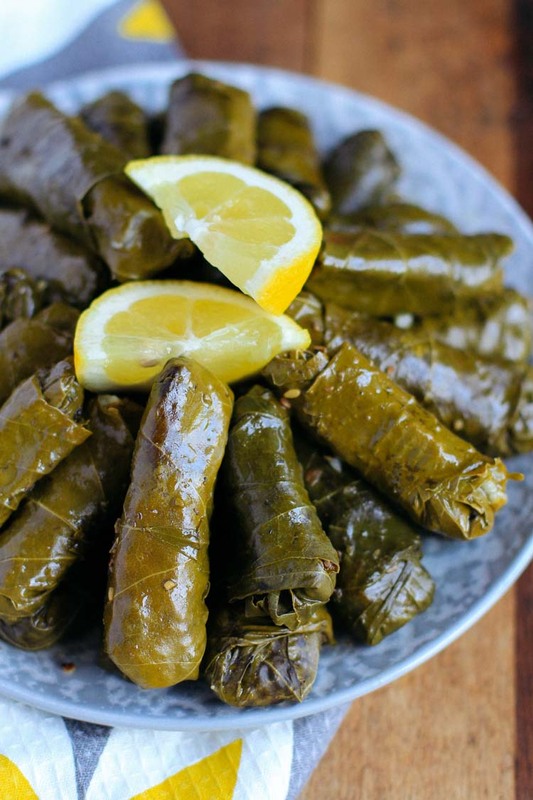 There are some varieties in the ingredients and the technique depending on the region of the recipe, but it’s essential stuffed grape leaves. The Greek call it Dolmades. The Turks call it Dolma. The Lebanese call Warak Enab/Arish. 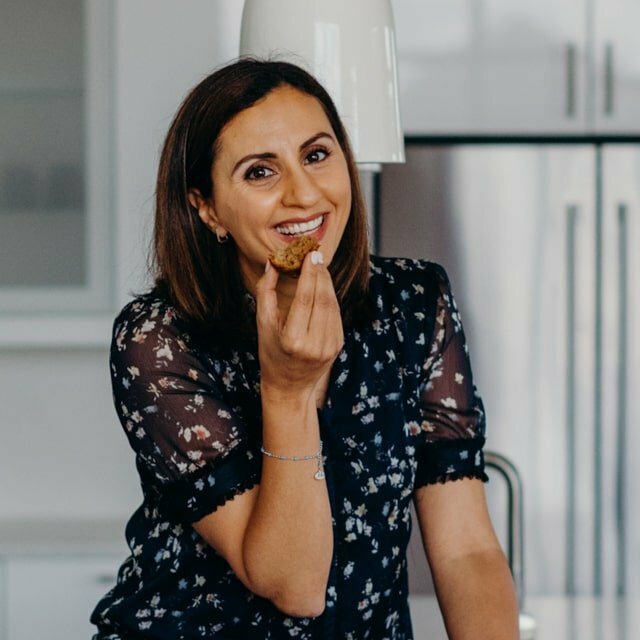 If you make this healthy-ish feelgood Lebanese Stuffed Grape Leaves recipe, please be sure to leave a comment and/or give this recipe a rating! I would love to hear about your experience making it. And if you snapped some shots of it, share it with me on Instagram so I can repost on my stories! Drain grape vine leaves and soak them in a large bowl of water. Gently separate and wash the leaves, stack them on a plate and set them aside. It is best to cover them with a damp cloth so they don't dry out, until you are ready to start rolling them. Add rice to the ground beef along with the remaining 1 tbsp olive oil and ½ tsp of salt, AllSpice seasoning, cinnamon and black pepper, and mix well. 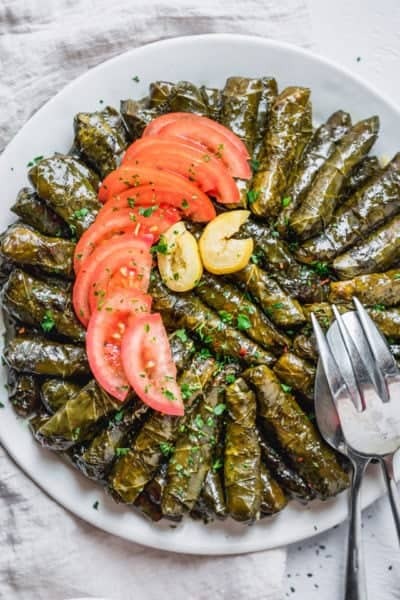 To stuff and roll the grape leaves, lay a grape leaf flat on a cutting board, scoop out a heaping teaspoon of the rice mixture into the center of the grape leaf, and carefully fold in the sides and roll it like you would when making a wrap. The trick is to roll it tightly enough so that it doesn't unravel while cooking, but not too tightly since the rice needs room to expand as it cooks. Place all the wrapped grape leaves in a tray. 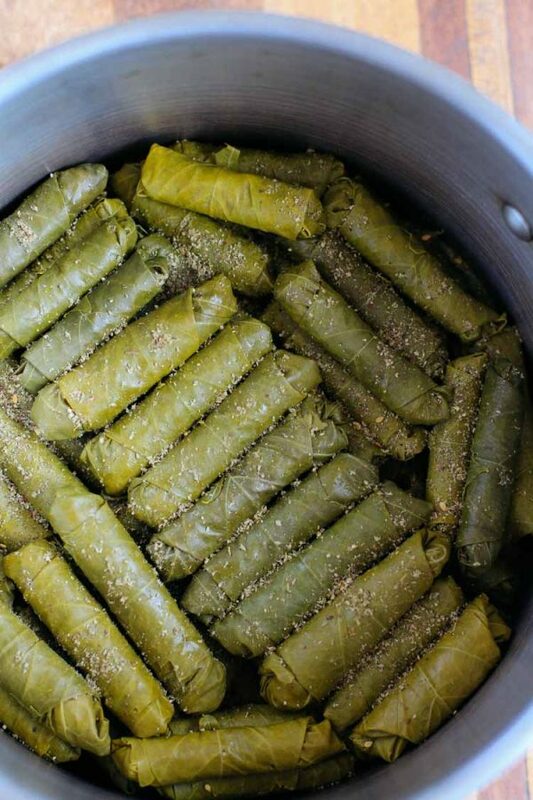 Neatly arrange the stuffed and rolled grape leaves in rows, alternating directions, to completely cover the circumference of the pot. Drizzle each layer with olive oil and season with salt and pepper to taste. Place small round plate on top of grape leaves in the pot to hold them down and prevent floating while they are cooking. Add enough boiling water to completely cover the grape leaves and the plate, then cover the pot and cook on Medium heat for 30 minutes, until most of the water is absorbed and the rice is cooked. Add the lemon juice on top of the grape leaves, then cook on low heat for an additional 45 minutes. Remove from heat and let cool uncovered. Transfer to a dish and enjoy warm! 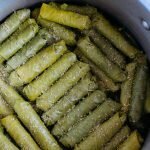 Recipe: There are so many variations of this grape leaves recipe depending on the region adapted from. 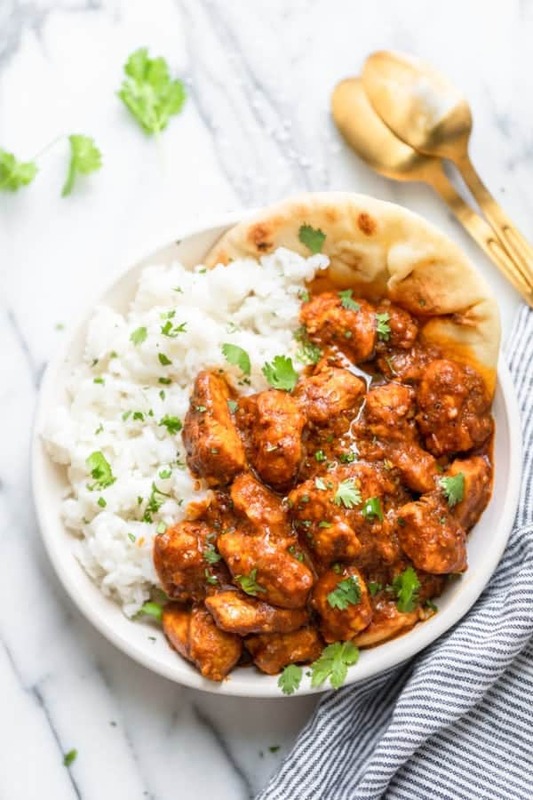 There is no absolute one way to make this dish, but this was the recipe passed down from my Lebanese parents and it's one that I've made and enjoyed for many many years. Make Ahead Tips: You can make the hashweh stuffing up to 2 days in advance. You can also wash the grape leaves from the brine in advance to minimize last minute work. Sourcing: You can find jars of grape leaves at Middle Eastern markets, natural-foods stores or even in large supermarkets, often located with other Middle Eastern ingredients. You can also buy on amazon.com. These are my favorite brands: Orlando or Cortas. Equipment: If you have a pressure cooker, the grape leaves can be made with that. Just pack them rolled grape leaves in the pressure cooker, add the water, close and cook for 15 to 20 minutes at the first pressure mark. Nutrition: Please note that the nutrition label provided is an estimate only. 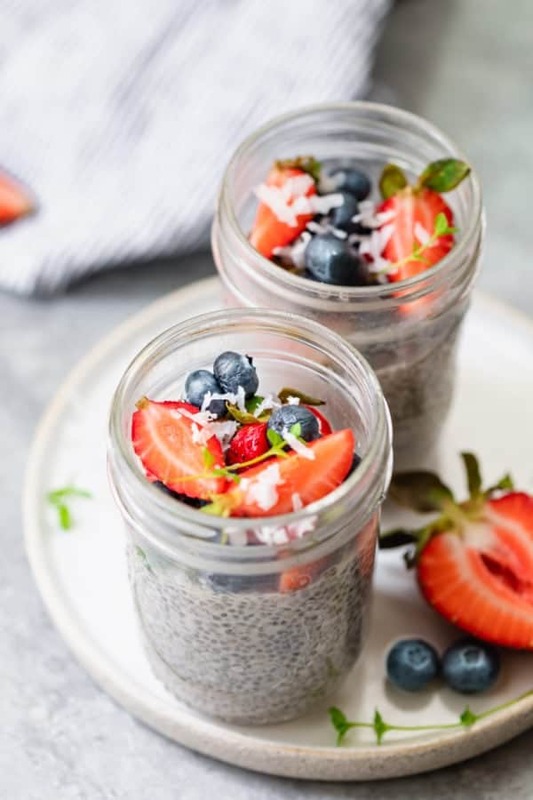 It will vary based on the specific ingredients used.